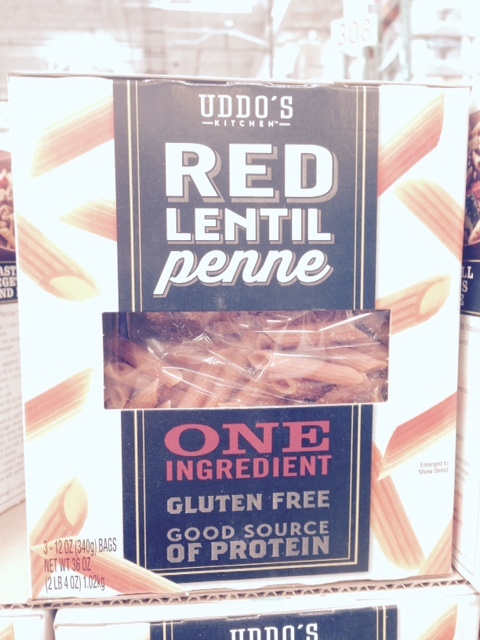 Red lentil pasta — another gluten-free choice? Fears about gluten, fears which are misplaced for most people by the way, are fueling a boom in non-wheat-based pastas. I’ve written about an edamame pasta I bought at Costco after sampling it there and finding it quite tasty. Costco now also has red lentil pasta. I took the accompanying pictures of it on a recent shopping trip. I go to Costco weekly and am always on the lookout for low-salt, low-fat new products. Red lentil pasta at Costco, trumpeting that it has only one ingredient. The package trumpets that the pasta includes only one ingredient, red lentil flour, a nod to the search for simple labels and simple ingredients these days. A look at the nutrition panel shows very little salt and very little fat, both pluses for me. A serving also has 14 grams fo protein, which seems a goodly amount knowing that one so-called serving of pasta is never enough. 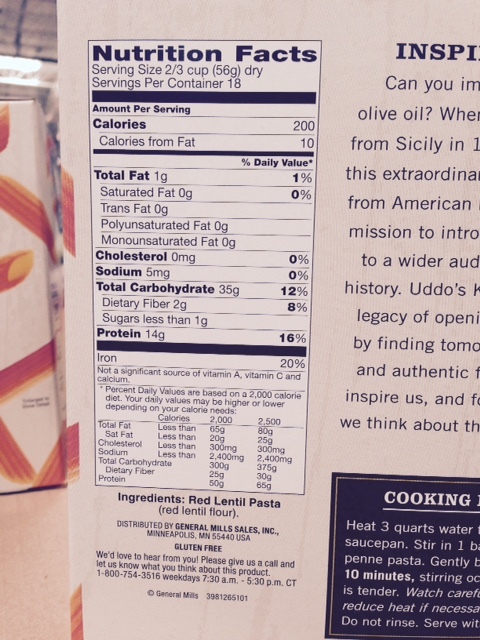 Red lentil pasta appears to be low in fat, low in sodium, and high in protein. But while I was looking at it, another woman came by and complained about the amount of carbs in a serving, 35 grams. So if you’re avoiding carbs, this might not be the pasta for you. I didn’t buy it, we’re still working our way through the Costco-sized box of edamame pasta we have. But I may grab it next time I see it.